Some like lavender. Some like mint. We appreciate a certain level of homeopathy in our lives and have both developed a taste for certain herbs. Now, while we’re alike in many ways as most siblings are, we’re also pretty divergent. Exhibit A: our favorite herbs. M’s more savory, a mint girl, and A’s more floral, a lavender lady. It’s very telling – so different, but they go together so well. M: For me mint is the word. I like it in everything from my tea, to my hot chocolate to my alcoholic beverages. Nothing like a summertime mojito. I can’t get over how wonderfully refreshing it is, settles my constantly upset stomach and secretly keeps my breathe fresh without anyone realizing. It’s also my secret weapon to hydration… I can’t bring myself to drink multiple cups of water a day but I can easily down cups of mint tea with no problem. I have also found its delicious cold. Just brew it in a tall glass pitcher and then keep it in the refrigerator once it has steeped. A: I’m a floral kind of person and lavender is pretty and soothing. It started with the scent (reminds me of France, tear! )… I started surrounding myself with it – eye mask, soaps, lotion, bath salts, closet sachets, shampoo, cleaning and laundry supplies. It’s even the pattern on my shower curtain and bathroom towels (I know, the obsession is past the point of no return). I’ve gradually added it to my food line-up as well. Lavender syrup does wonders in tea and champagne, and Herbes de Provence make a delicious roast. 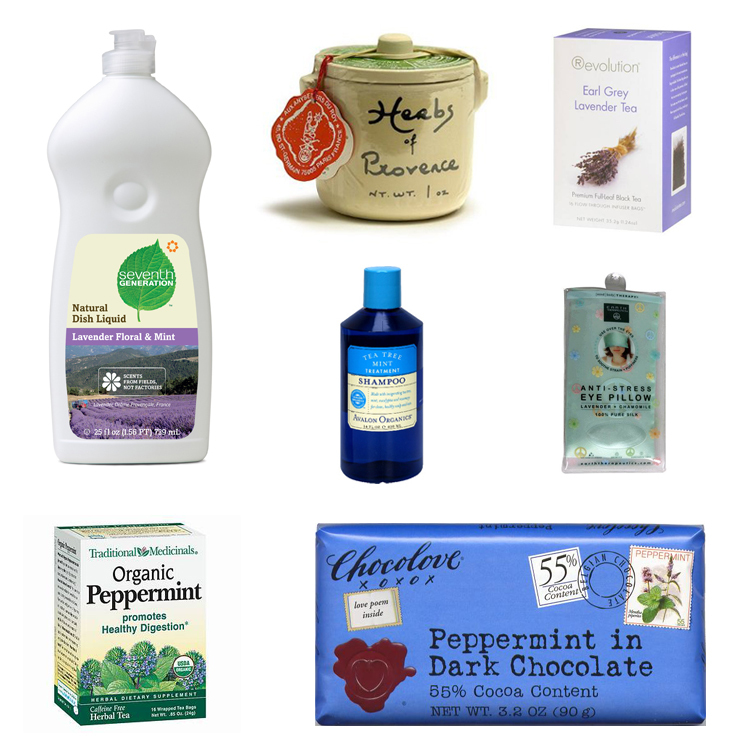 M: You can find mint in my bathroom too… I have used Avalon Organics Tea Tree Mint shampoo and conditioner for years now. I like that it feels tingly and smells refreshing while you’re in the shower but you don’t get out smelling like a tube of toothpaste. I also use mint scented products to actually clean the bathroom. Nothing like Seventh Generation mint toilet bowl cleaner. Recently, I found dishwashing fluid that’s BOTH lavender and mint. Crazy. This just goes to tell you that these herbs go together as well as we do. A touch soothing and a touch energizing. We’ll be trying this recipe for Chamomile Lavender Mint Iced Tea when spring brings us a reason to need an iced beverage again.